With the help of an ELCD test, a pv manufacturer can evaluate the quality of the cells manufactured and any other possible defects caused by bad cell quality and/ or later mishandling of photovoltaic panels. What defects can the ELCD test detect? With the help of the ELCD test, a manufacturer can detect defects that are normally not visually detectable. Broken cells and micro-cracks in the cells. Why perform an ELCD test? The ELCD test can detect hidden defects that were before untraceable by other testing methods, such as the thermal camera, V-A characteristic and flash test. 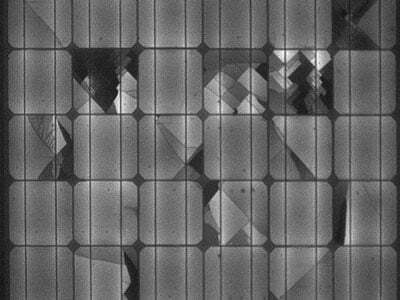 Micro-cracks negatively impact the long term performance of pv cells. Is the ELCD test enough to perform quality control? Micro-cracks do not necessarily mean that the performance of the cells is affected. And the performance of the cells or the impact of micro crack on cells can not be measured with an ELCD test. The real performance can be measured with a flash test. However, panels with cracked cells are potential candidates for future performance degradations that in the worst case bring down a whole string and therefore the whole output of the installed system. PV quality specialists such as our partner Kisun would never accept to let pass any cells that show micro cracks: as the long term performance can be affected, the cells should be replaced. 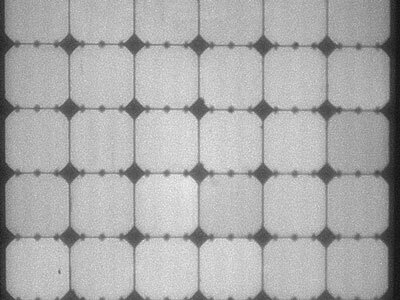 Panels suffering from many micro-cracked cells are optimally replaced, too. For this reason, it’s best to perform the ELCD test before the lamination process, so the defects solar cells can be replaced before being assembled into the panel. After the lamination process the ELCD test can be performed again, to see if the cells have gone through the lamination process without any damage. Do you have any experience with ELCD tests? Feel free to comment! Are you purchasing solar panels, inverters or mounting racks in the Greater China region? Our partner Kisun Solar performs independent quality inspections on-site at solar manufacturers. It would seem to me that the EL tests is mostly of interest just to the manufacturer (rather than the buyer/inspector) as it ensures they don't create waste by placing under-performing cells in to a module. In the end, the flasher test will show what is the output of the module, and this is what the buyer is interested in. Im trying to find the real value of this test in the PSI. You mentioned however about "Micro-cracks negatively impact the long term performance of pv cells". Could you expand on that? Do you have any figures or stories/experience of that? Please bear in mind I am new to this field, and so my questions may be v. basic. Hi a_mounsey, I'm don't think that the ELCD test is just for the importer/reseller/inspector, to me it looks to be a way to detect solar cell and module defects that might otherwise be missed. I would feel more comfortable trying to explain the benefits of this test to customers than the output performance/ I- V curves of solar modules to clients as sometimes it is hard to convey a products strengths or weaknesses due to the technical way panel specifications are provided by manufacturers. what's the use of a more efficient panel if there's a possible problem in the manufacturing process which means that panel will have problems going on with it that results in losses in output performance. A product that guarantee a slightly smaller output for the long term would have to be better than a product that might have higher output but for the short term. Solar products need to go the distance of 25 years + so we can build a solid reputation for this industry and create confidence with the public. I would prefer a product that's had the ELCD test done to it than one that didn't from the information given here. I'm wondering if a list of Module manufacturers that conduct the ELCD test can be provided? it was interesting that the ELCD test doesn't test the output of the module but that microcracks reduce the long term perfomance of a module. Like a_mounsey asked above could more information be provided on how the microcracks affect the modules long term output and any data on that would help! So if a manufacturer gave a performance guarantee of 80% for 25 years how do they come to that conclusion?